a. Letter: "The CANUSA Agreement"
d. NSA Historical Collection: Series V, A.22 (Tab E), Series V.J.3.3, and Series VII, 19, Box 4, 3k. e. This unlikely format for an agreement was in actuality a letter from the chairman of the Communication Research Committee to the chairman of USCIB in which he proposed to clarify the existing Comint relations by offering a new set of proposals which, if the U.S. agreed, could serve as the basis for a new agreement. The proposals included provisions for the exchange of [one half line redacted] data, and a variety of other information. The agreement would apply to all Canadian and U.S. Comint authorities which existed at that time or in the future. This was not the first exchange between the U.S. and Canada. Collaboration with Canada on Comint matters dated to before the U.S. entry into World War II. So there we have it. The Guide confirms the name "CANUSA Agreement" and confirms that Crean's letter of 27 May 1949 (referenced in the 29 June 1949 reply) contained the proposed terms of the agreement. This NSA document also provides official confirmation of the signing of the CANUSA Agreement in 1949. I would quibble a bit with the Guide on a couple of points. First, an exchange of letters is not that unlikely a format for an intergovernmental agreement (there must be hundreds of Canada-U.S. agreements in place as a result of such exchanges). Second, in keeping with the protocol of such exchanges, it is the reply accepting the proposed terms of the agreement that actually seals the agreement, so unless the 27 May 1949 letter specified a different date for entry into force it seems more appropriate to me to date the CANUSA Agreement to 29 June 1949 rather than 27 May 1949. That said, apparently there was also (as Matthew Aid reported) a formal signing of the agreement in November 1949. (Kurt Jensen similarly reported in his book Cautious Beginnings: Canadian Foreign Intelligence, 1939-51 that a November-December 1949 conference "ended with the signing" of the agreement.) It is possible that the agreement didn't enter into force until that signing. 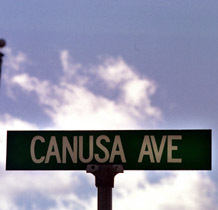 The CANUSA Agreement was based more or less closely on the text of the BRUSA (later renamed UKUSA) Agreement of 1946. Now that the text of the UKUSA Agreement has been released, is there any reason why the CANUSA text should remain under wraps? Update 1 January 2016: You can read the 1953 version of Appendix B of the CANUSA Agreement here. Update 23 April 2017: The 1949 version of the CANUSA Agreement was finally released, minus appendices, in April 2017. Update 31 March 2019: See here for a substantial part of the appendices.